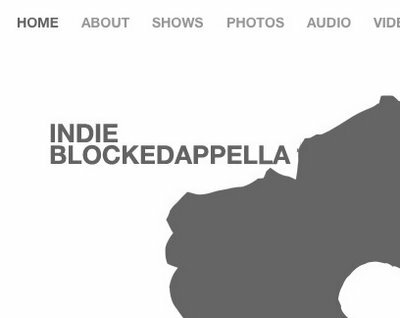 Indie Blockedappella (why not Rockappella? copyright issues?) makes these cute acappella versions of indie songs like "Rebellion (Lies)" and "Be Gentle With Me". They're not the best singers, and sometimes brink on whiny and annoying, but it's nice just to hear something besides "She Will be Loved" be acappella-ized once in awhile. I couldn't figure out how to get direct audio links from their site, so you probably just have to subscribe to their podcast. Or visit their myspace. But I advise you subscribe, if only to avoid the visual monstrosity that is myspace.